To indicate that occasionally the contralateral facial nerve provides redundant innervation to the hemi-face. Single case report. We report the case of a patient whose facial nerve was transected during removal of a 3 cm vestibular schwannoma. 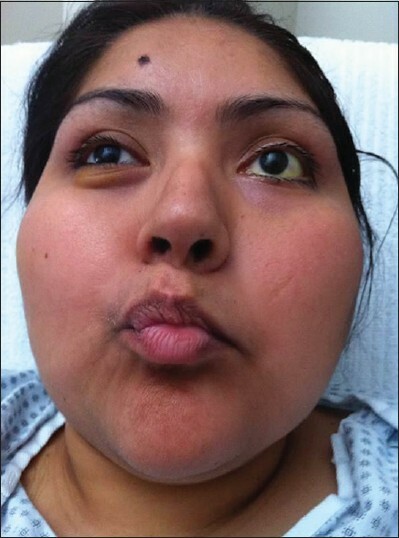 Postoperatively, this patient still demonstrated spontaneous mimetic motion on the side of the face ipsilateral to the transsection. Review of the literature finds rare instances of preserved function after nerve transection in the removal of large parotid masses. We speculate that the slow loss of ipsilateral function can at times contribute to innervation from the contralateral facial nerve. Surgical resection of vestibular schwannomata has four main goals: Preservation of life, decompression of the brainstem, removal of the tumor, and preservation of the facial and auditory nerve functions. Injury to the facial nerve causes unpleasant sequelae from the paralysis of the ipsilateral face. Mood suppression has been reported from the loss of spontaneous mimetic motion. The eye is placed at risk for corneal abrasion and vision loss. The ipsilateral naris becomes congested and the oral commissure incompetent. Measures taken to prevent nerve transection during surgery are the use of sharp dissection, facial nerve electromyography (EMG) monitoring, and microscopic magnification. Unfortunately, facial nerve transection occasionally occurs despite these precautions or is necessary for complete tumor removal. We present a case with residual facial nerve function after complete transection of the facial nerve at the brainstem. Persistent innervation of the ipsilateral side of the hemi-face was documented by physical examination and EMG. Reports of spontaneous return of facial function after facial nerve transection in the parotid, suggest reinnervation via other pathways. , Subsequent persistence of this renewed function after second parotidectomy suggests that the paths of the innervation are medial to the operative field. , However, there are no reports of persistent motor function of the hemi-face directly after facial nerve transection. This phenomenon has previously been seen by one of the authors (MIR), but has not been reported anywhere in the literature. 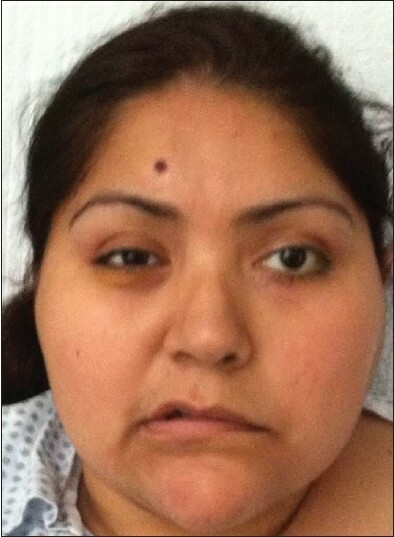 A 34-year-old female patient presented with left-sided anacusis and House-Brackmann Grade I ipsilateral facial nerve function. A 3.3 × 2.7 × 2.6 cm mass filled the left internal auditory canal, expanded into the cerebellopontine angle, and compressed brainstem [Figure 1]. The patient elected to undergo surgical resection. During a suboccipital approach for removal of tumor, the facial nerve was identified at the brainstem and was stimulated at 0.1 mA. However, the facial nerve was transected in the cerebellopontine angle during tumor resection. The cut end of the facial nerve was identified and confirmed with electrical stimulation. After removal of all tumor, the proximal and distal facial nerve branches were identified and primary reanastomosis was completed with a tension free closure. 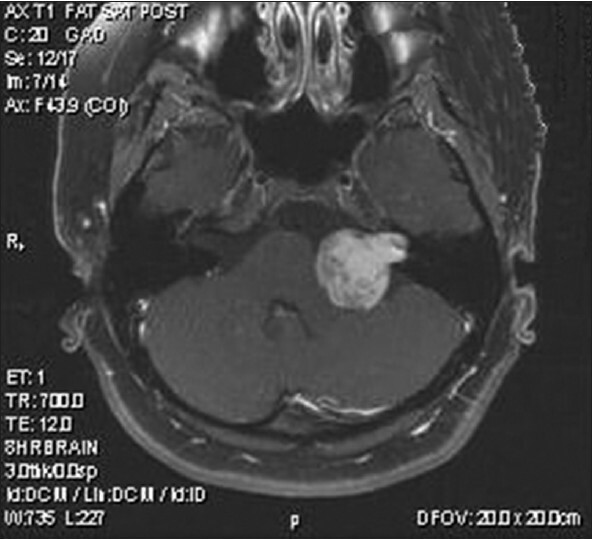 Pathologic evaluation confirmed the diagnosis of vestibular schwannoma. 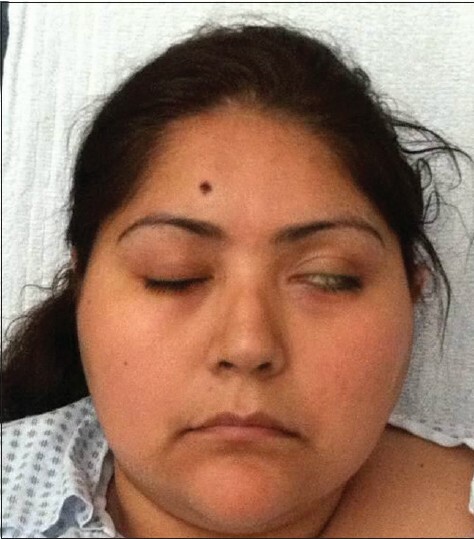 On postoperative day 1, the patient was noted to have spontaneous mimetic motion on the left-side of her face. Voluntary motion also was present, but was less robust. Resting tone was present [Figure 2]. The left lid blinked briskly, but incompletely, in synchrony with the right blink. Voluntary complete left eye closure was slow [Figure 3]. The left nostril flared in synchrony with right nostril flaring, but with fewer excursions. Spontaneous lip motion while talking was noticeably natural and voluntary pucker approached normal function [Figure 4]. The angle of mouth was weakly mobile resulting in a weak grimace [Figure 5]. Two days postoperatively, concentric needle EMG was performed in selected muscles of the left face. At rest, all muscles demonstrated normal resting tone. Voluntary contraction could not identify recruitment of motor unit action potentials in the obicularis oculi, frontalis and obicularis oris muscles. However, voluntary contraction of the left mentalis muscle elicited normal motor unit action potentials. Subsequent examinations over a period of 4 months found persistent mimetic expressions of the left face, with no apparent diminution of function. 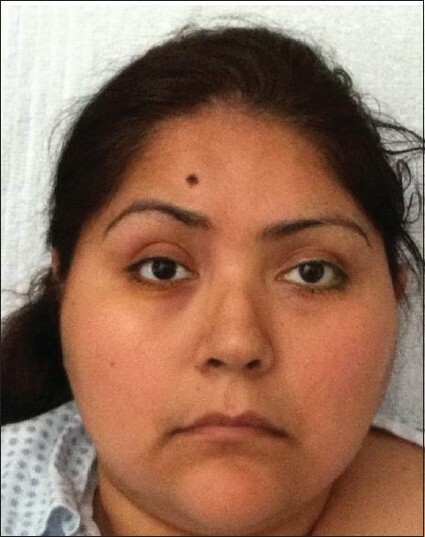 No facial nerve rehabilitation operations were planned for this patient, since her appearance during social interaction was already natural and spontaneous. She also had no eye complaints or any oral incompetence. This is the second patient in the senior author's experience in which surgical section of one facial nerve did not deprive the hemi-face of its entire function. In both cases, the underlying disease process was of longstanding duration as judged by the tumor size. One key feature of this case is the more robust facial motion during casual conversation, than during voluntary contraction of facial muscles. While voluntary motions appear to arise from pyramidal pathways, the emotions appear to travel via extrapyramidal pathways. Implicated are the cingulate area, orbital and frontal areas, the amygdala, and the hypothalamus. Involuntary facial motions have been observed after central lesions have transected the paths from the motor cortex to the facial nucleus centrally. In these cases, the voluntary motion is lost, while the involuntary remains. In this case, the nerve itself was transected, and both voluntary and mimetic motion persisted, although the mimetic motions were stronger. Another issue in this case is the route of secondary innervation to the face. Crossover fibers to and from the facial nerve have been demonstrated in the trigeminal nerve, nervus intermedius, vestibular and glossopharyngeal nerves, vagus and spinal accessory nerves, hypoglossal and the cervical nerves. , Conley reported  reinnervation of dennervated hemi-facies after facial nerve transsection during extensive head and neck surgeries. The resultant function subsequently remained unchanged after the area underwent a second resection. Since the routes of reinnervation escaped injury during the second resection, this suggests that the new routes were medial to the resection plane. In our case, aberrant innervation of the affected hemi-face appears to have occurred preoperatively. Whereas in the literature, the relevant fibers found their ways to target mimetic muscles postresection, our patient's pathways formed before resection, presumably during the course of tumor growth. Animal studies shed some light on the potential routes of spontaneous reinnervation. Bischoff's animal studies  found that the reinnervation after parotidectomy was not via the contralateral facial nerve, because return of facial function remained intact after the contralateral nerve was subsequently sectioned. Instead, the medial stump of the ipsilateral nerve was somehow supplying fibers to the face, since the postoperative return of facial function was abolished by ipsilateral transection further medial along the nerve's route. In our case, the nerve was sectioned in the cerebellopontine angle; therefore the source of reinnervation was a central one. Furthermore, the patient showed better mimetic than voluntary motion, presumably also because the impulse for the motion was a central one, and probably also had an extrapyramidal component. In our patient, too, motion was better in the mid face: The lips pursed better than grimaced [Figure 4] and [Figure 5], the nostril could flare, but eye closure was slower [Figure 3]. This mid face function suggests that the contralateral nerve was supplying fibers to the side in question [Figure 2]. Voluntary motion was present directly postoperatively, while spontaneous mimetic motion was stronger. This suggests an extrapyramidal component to the motion, whose impulses are initiated centrally. Motions in the mid face-nostril flaring, and pursed lips-were stronger than more lateral motions-eye closure, and grimace. This suggests that the path of the aberrant fibers were through the contralateral facial nerve. 1. Bailey BJ, Johnson JT, Newlands S. Acute facial nerve paralysis. Head and Neck Surgery - Otolaryngology. Philadelphia: Lippincott, Williams and Wilkins; 2006. 2. May M, Schaitkin B. The Facial Nerve. 2 nd ed. New York, NY: Thieme; 2000. 3. Conley JJ. Symposium: Facial nerve rehabilitation. Accessory neuromotor pathways to the face. Trans Am Acad Ophthalmol Otolaryngol 1964;68:1064-7. 4. Bischoff EP. In: Sachs E, Valtin E, editors. Microscopic Analysis of the Anastomoses between Cranial Nerves. Hannover, NH: University Press of New England; 1977.